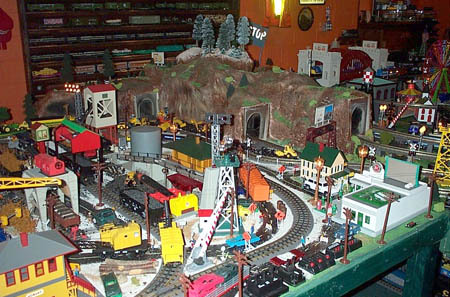 Rob's layout has grown as has his collection. Rob is one of the biggest promoters of our hobby. Now if I could only get him to adopt me! Email Rob! Rob works at KDKA Radio in Pittsburgh and one of the biggest train guys I know. Rob and I can spend hours on the phone talking about the hobby and it's future as well as bounce ideas off each other. He is a good friend. Rob's kids are into the trains just as much as he is and it seems that his wife has grown an interest as well. She inventories all of Rob's collection. 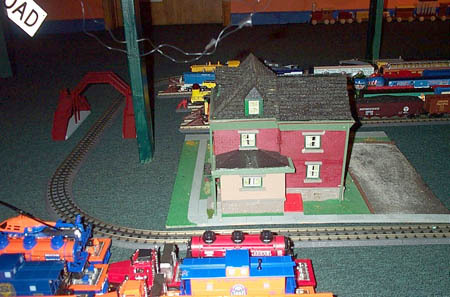 He is currently working on a overhead train layout that will be in his downstairs family room. It is quite an ambitious project! 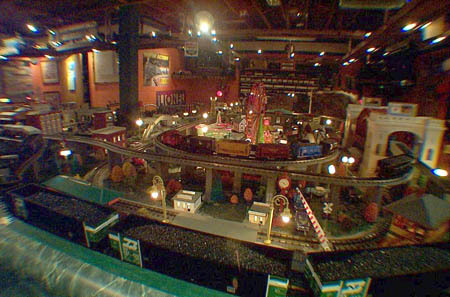 A wide angle shot of Rob's layout from near the door. There is a ton going on in this room! The view from the control panel. The lens distorts quite a bit but if you look close there is an overhead track system as well. From the far corner looking back. 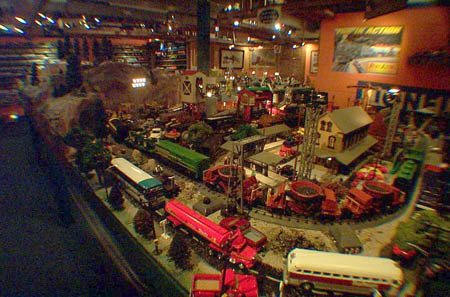 Rob's whole room is filled with classic toy train and real train memorabilia. The walls are also painted as a Lionel Box. With the wide angle lens gone we can see more detail. Seems like no manufacturer goes unused! 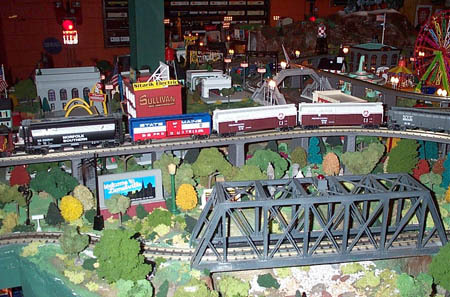 MTH RealTrack is the primary contractor but accessories and trains come from all manufacturers. 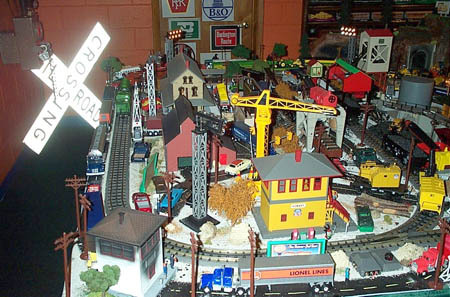 There is so much to see on the layout. I counted about 7 seperate loops but it could be more. 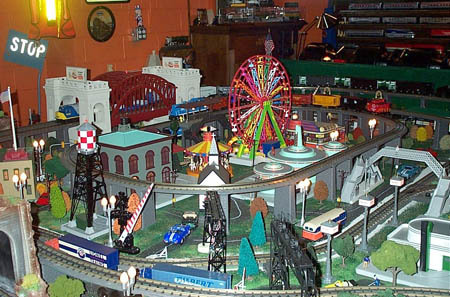 Then add the overhead loops and there is train action everywhere. 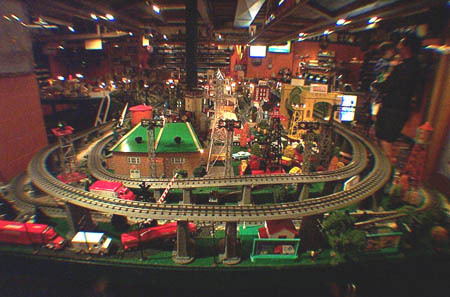 This is the industrial part of the layout. As you can see buttons for accessories are where folks can get to 'em. Another look. Note the RR sign in the back. Rob has amassed quite a bit of RR paraphernalia.